Glycogen Assay Kit ab65620 is an easy and accurate assay to measure glycogen levels in biological samples. In the glycogen assay protocol, glucoamylase hydrolyzes the glycogen to glucose which is then specifically oxidized to produce a product that reacts with OxiRed probe to generate color (570 nm) and fluorescence (Ex 535/Em 587). The assay can detect glycogen 0.0004 to 2 mg/ml. If your sample is likely to contain reducing substances, we recommend using Glycogen Assay Kit II (ab169558), as reducing substances may interfere with the assay detection method. Glycogen is the primary short term energy storage molecule in animals. It is synthesized primarily in the liver and muscle. Glycogen is a highly branched polymer of glucose molecules, connected with an alpha-1,4 linkage, branching via an alpha-1,6 linkage. Abnormal ability to utilize glycogen is found in diabetes and in several genetic glycogen storage diseases. Functional studies - ab65620Image from Roy Choudhury G et al., PLoS One 10(4), Fig 6c. Doi: 10.1371/journal.pone.0123096. Total glycogen levels in C576bL6 mice astrocytes were determined by using Glycogen assay kit (ab65620). At 24 hours following OGD-reoxygenation, astrocytes had less glycogen levels compared to normoxia control. Astrocytes treated with Methylene blue (MB) showed a higher glycogen content compared to non-MB treated, OGD-reoxygenation astrocytes. * p < 0.05; ## p < 0.001 Vs. OGD-reoxygenation control / 0 μM MB. Example of fluorometric standard curve using Glycogen Assay Kit (ab65620). 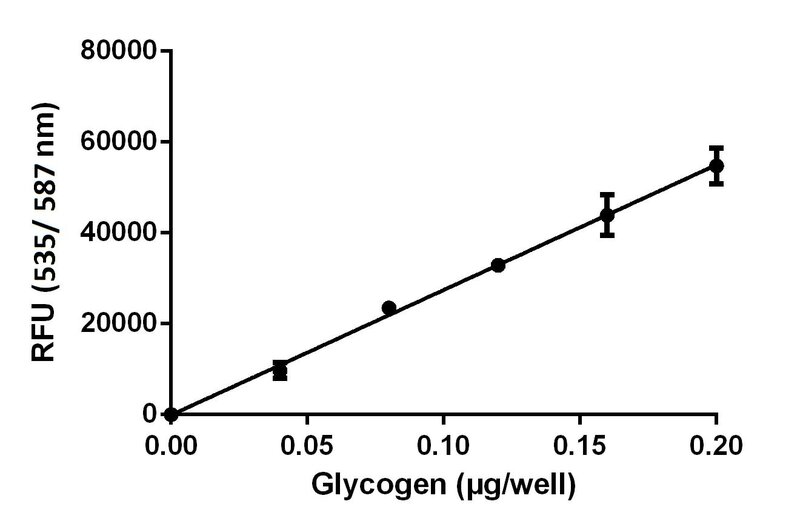 Measurement of glycogen in various mouse tissues using Glycogen Assay Kit (ab65620). 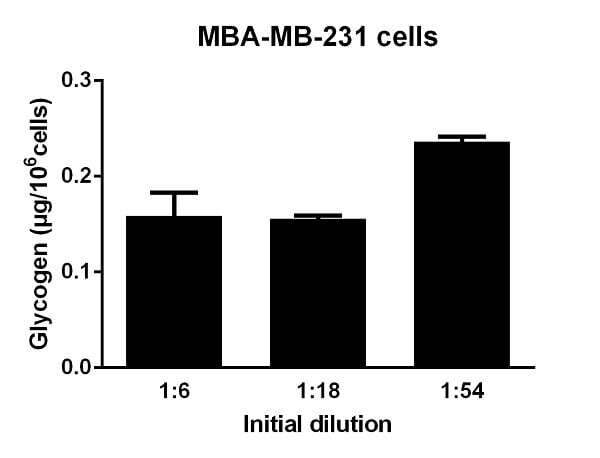 Glycogen concentration measured in MBA-MB-231 cells (human breast adenocarcinoma cell line). 106 cells were prepared following protocol instructions, and several dilutions were measured using fluorometric detection. I'm growing mouse primary hepatocytes on a collagen gel, lysing the cells in the gel, then continuing with the assay (this may result in some collagen inevitably being transferred as sample). In my sample and control wells (without hydrolysis buffer) as soon as I add the developer all wells turn very bright red and then turn clear after only a few minutes. Do you have any ideas what may be happening and advice on how to prevent this? Cells within collagen or Matrigel matrix are not ideal since when you homogenize the samples in the matrix and boil them, the matrix or components of the matrix can come along with the sample. This can affect the assay. Without knowing exactly what goes into this matrix, it is difficult to say what the affect will be and what component is inhibitory. We have not tested this type of sample in the culture matrix. For samples with reducing substances ab169558 is a better choice. If you are using something like Matrigel for culturing the primary hepatocytes, then it is essential to remove the gel and collect the cells before proceeding with the homogenization and boiling to extract the glycogen. Liver cells store glycogen and hence it is critical to optimize the volume of the sample used per well such that the values are within the linear range of the std. curve. How stable is the fluorescent signal? The fluorescent signal is quite stable for several hours when protected from light. However, we recommend measuring the plate immediately after incubation for the best results. In comparing these 2 Glycogen assay kits (Glycogen assay kit and glycogen assay kit II) I see that Assay Kit II requires no boiling step to inactivate enzymes in the sample. but Glycogen assay kit (I) does require a boiling step. Is this a mistake or is there something different about the buffers in assay Kit II that makes boiling unncecessary. ab65620, Glycogen Assay Kit, can detect glycogen 0.0004 to 2 mg/ml. This kit can be used in both colorimetric and fluorometric applications. In this assay, glucoamylase hydrolyzes the glycogen to glucose which is then specifically oxidized to produce a product that reacts with OxiRed probe to generate color (λmax= 570 nm) and fluorescence (Ex 535/Em 587). Since the fluorometric version is very sensitive, this improved kit uses glycogen extraction and removes all enzyme activity by boiling to reduce glycogenolysis and the samples can be stored after this step to be assayed later. ab169558, Glycogen Assay Kit II (Colorimetric), can detect down to around 4 µg/ml of Glycogen in samples. This kit is colorimetric only. This assay is suitable for measuring Glycogen levels in samples that contain reducing substances, which may interfere with the oxidase-based assays like that used in ab65620. In this assay, Glycogen is hydrolyzed into glucose, which is oxidized to form an intermediate that reduces a colorless Probe to a colored product with strong absorbance at 450 nm. This is faster protocol without any glycogen extraction but not as sensitive as the fluorometric version. I'm trying to decide how to prepare my tissue samples for use with this glycogen assay kit. Protocol states that for 10mg tissue to suspend tissue in 200ul water. But then it states that for larger masses of tissue (a few hundred milligrams or more) there is a KOH extraction step. My sample is 100 - 150mg muscle tissue. Should I resuspend this tissue in a relatively greater amount of water (eg. 2-3ml) or should I use the KOH extraction method? For 100-150mg of a tough tissue like muscle, I would definitely recommend using the KOH method. You can also consult the literature for any other glycogen extraction method that may be preferable. Inquiry: Hi, A project partner of ours is interested in measuring glycogen levels in cattle (tissue samples). They want to complete the sample collection side of the work and then submit samples to us for analysis. Will we need to account for the residual glucose concentration in cattle by running 2 separate samples per animal and use the hydrolysis enzyme mix on only one of the samples? In terms of kit components, are 96 well plates included with the kit or should they be externally sourced by us? If the latter, what type of plate is recommended? I can confirm that glucose generates background readings. Since glucose is present in your sample, we strongly recommend to do a glucose control without the addition of hydrolysis enzyme to determine the level of glucose background in your sample. The glucose background can then be subtracted from glycogen readings. Since every sample can be very different in its glucose levels (even from the same animal taken at different time points), we recommend to have two measurements for every sample: One with hydrolysis enzyme to measure total glucose (background glucose plus glycogen) and one without hydrolysis enzyme to measure glucose background alone. Fluorescence: black wall plates with clear bottoms. This kit was optimized using water, and unfortunately we don't have any data on whether Levamisol might work. This would have to be tested. PBS can be used in place of water for homgenizing. I want to assay glycogen content in the cell using abcam kit. I would like to know whether I can cell lysis buffer to lyse cells and whether lysis buffer will affect the measurement result of glycogen. If i can use lysis buffer, can you let me know which kind of buffer is fine for this assay, is ripa buffer ok? whether need add protein inhibitor cocktail? Are you inquiring about ab65620? If so, you will not need to use any lysis buffers with this product. For tissue or cell samples with this kit you will homogenize 10^6 cells or 10 mg tissue with 200 μl dH₂O on ice. Then boil the homogenates for 5 min to inactivate enzymes. Spin the boiled samples at 13000 rpm for 5 min to remove insoluble material; the supernatant is ready for assay. Please advise the shipping conditions of ab65620. Is it 4C or -20C? The shipping temperature for this kit is +4C and for storage temperature please refer to the protocol.